Russia boasts of rigging Trump’s election: braggadocio or blackmail? Russian politicians, talking heads and the hosts of prominent state-media talk shows are claiming the bragging rights to rigging the U.S. elections, in order to secure Trump’s victory. The sum total of Russia’s not-so-subtle messaging should not be underestimated. “It’s just ridiculous, what kind of intelligence in the USA one can even talk about?” he added. “The US sagged in all these aspects for the past two decades. This superpower is losing its ability to define the world.” (Detailed translation courtesy of CNN). Later in the show, Nikonov went on to opine that the U.S. intelligence services are inferior to those of Russia. According to Nikonov, Russian intelligence agencies possess more information about North Korea, Afghanistan and Syria, as compared to their American counterparts. Nikonov’s statements are significant for several reasons: he has served on the staff of Mikhail Gorbachev, Boris Yeltsin and Vladimir Putin. Experts on Russia know that Nikonov specializes in GOP and American politics. He is often deployed for major propaganda blasts. As a sidebar note, Nikonov is a grandson of Vyacheslav Molotov – prominent Bolshevik and Soviet foreign minister under Joseph Stalin – after whom Nikonov was named. Simply put, Nikonov is an established, reliable state actor, whose messaging is always in strict compliance with that of the Kremlin. For example, Nikonov was previously dispatched to deliver the message about Moscow’s willingness to use nuclear weapons in a conflict with NATO, including but not limited to Russia’s defense of the annexed Crimea. Not coincidentally, his statement was in perfect harmony with Putin’s admission that Russia was prepared to bring its nuclear weapons into play with respect to asserting its alleged rights to Crimea. The meaning of the message Nikonov was delivering is twofold. The Kremlin is undoubtedly reveling in the perceived failure to counteract their willful meddling in the U.S. elections. Putin himself is no stranger to boasting, even at the expense of revealing his own deception. He infamously bragged about the participation of Russia’s special forces in the annexation of Crimea, having previously denied that any such activities took place. The second aim of this messaging can be construed as possible blackmail, directed against Trump. The Kremlin is growing increasingly frustrated with American leader’s inability to deliver a reset, better relations and the lifting of sanctions. 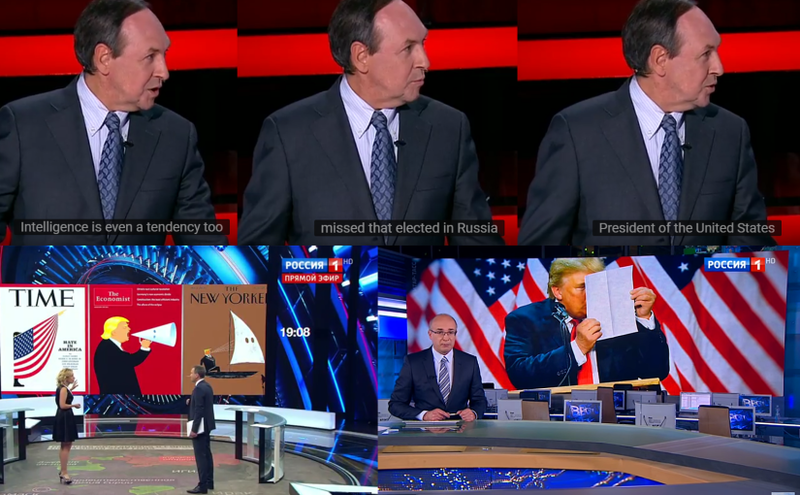 Russian state media hosts Evgeny Popov and Olga Skabeeva (’60 Minutes’) repeatedly questioned why Russia elected such a crummy U.S. President. At the same time, Russian state media doesn’t question Trump’s and Tillerson’s willingness to play nice with the Kremlin. They blame “the deep state” for not allowing such a cozy reset. Russian state TV show “Vesti Nedeli,” hosted by one of Russia’s foremost Kremlin propagandists Dmitry Kiselyov, suggested that Tillerson fell in with “bad company,” that isn’t allowing him to live up to his Russian friendship medal. The culprits were identified as White House Chief of Staff, General John Kelly, National Security Advisor, General H.R. McMaster and United States Secretary of Defense, General James Mattis. In order to avoid “interference,” the RT panel previously suggested that Trump should “decapitate” anti-Trump leakers in the intel community, purge the State Department, the CIA and the Pentagon. Maria Zakharova, the official spokeswoman for Russia’s Ministry of Foreign Affairs, implied that Trump may not finish his term in office. She specifically clarified that this statement was not related to the possibility of Trump’s impeachment. As relations between the United States in Russia continue to deteriorate, the message from the Kremlin to Trump may be interpreted not only as Cold War-style mocking, but also as a warning: follow through on your promises to Russia, or be delegitimized if the Kremlin officially admits to rigging the election. Regardless of Russia’s intentions, the evidence of election meddling continues to snowball – not only through the Kremlin’s official and unofficial mouthpieces, but also in course of multiple ongoing investigations.